August and September 2015 were really though for both option sellers as well as buyers. When the volatility is just too high and not willing to go down then its not a good sign for option sellers, as even if the time passes option prices do not melt. For buyers its the stress rather than the volatility. Simple reason being they pay more to buy options – that’s stress. When VIX was low they never paid so much to buy an option of a similar strike. Say ATM (at the money) – when VIX was hovering around 12-15 they only paid 120-150 for ATM option. VIX at 20 means they will have to shell out 200 or more points to buy ATM option. Exactly 4 weeks to expiry Nifty ATM 8100 CE is quoting at 174.00. VIX at 19.88. This after two weeks already passed since the start of October 15 series. So lets assume buyers were lucky last time and made a cool return. At that time VIX was low and ATM option was quoting at around 150. If they take it out at 200 – a 50 points profit. Next month when VIX is high they need to shell out the principal + the profits made from previous trade to take a chance. Now when this option reaches 150 – the buyer is not willing to take a loss since his reasoning is that after all at this point he is breaking even and can therefore wait. Unfortunately one day movement against the buy option will take the option to 100 and he is staring at a loss of 50 points and two months time gone. VIX high is very good for option seller as now they get more money for the same risk they are willing to take. 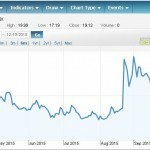 However there is a new problem they have to face and that is of huge volatility in markets. 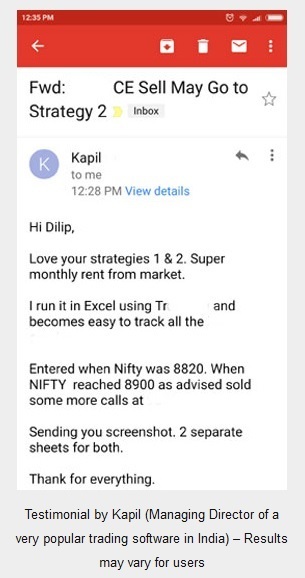 If you look at Nifty movement last 2 months the high was 8563 and the low was 7545. That’s 1018 points from high to low. In percentage terms fall was 11.88%. This was a great trading opportunity. See we are talking about an Index, and not a stock. There is more of a chance of recovery in Index than a recovery in stock. And I am a person who look for such opportunities and what can be done to use these kinds of opportunities. 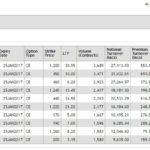 Instead of doing FDs, I park extra cash in ICICI Prudential Flexible Income Fund – its a liquid fund giving around 9% return. So the large cap fund had to be from the same fund house as switching is possible in the same fund house. The best large cap fund as of now in the ICICI mutual fund house is the ICICI Prudential Focused Bluechip Equity Fund. 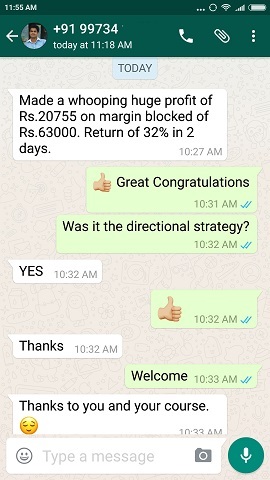 I logged in my account and switched 50% of the cash from ICICI Prudential Flexible Income Fund to ICICI Prudential Focused Bluechip Equity Fund. A lot of people will do this and make a profit. And next time when they get an opportunity they will shift all their money to some fund because they made a quick profit last time. This is where traders do mistake. They do not define risk and once they are in profits get into the next trade with all force. Then they lose it all. Look at how I only took a part out of holding in my liquid fund and transferred cash in an equity fund. Read that article again. My only wish was to bet the returns given by the liquid fund. That’s it – no greed here. That too on a part of my holding in that particular fund. On that day (4th Sep 15) the 7600 CE was quoting at 220. And at expiry day (24th Sep 15) it closed at 269. Well great if I held it till expiry my return would have been 22.27% in a matter of 20 days. But the big question is how do I know? You know what on 07th Sep 2015 the same option was quoting at 154.60. Hey you really need heart not to take a stop loss at that level. At that time as an option buyer my only feeling would had been what if this option expires worthless? These are the situations I will avoid at any cost. I will not let greed overtake me even if there is a 99% guarantee that a particular trade will make me money. I will protect my hard earned money – divide my risk – and take a calculated risk with my trades. Why I Did Not do Both The Trades? You mean trading the mutual funds and also buying the option. I will NEVER increase risk in a particular view. Here my view was for 1 year not 30 days. And once the target was clear it did not allow me to buy options. 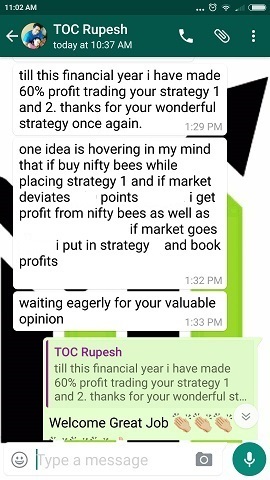 Today if Nifty was at 7400 – still I would have been happy as I know I still have 11 more months to hit my target. Even if it does not hit I can still hold it longer. With options however there is a time limit and that time limit is very short to make a trading decision. I mean I have told this thousands of time and I tell it again to Future buyers and Sellers – hedge your trades with options. 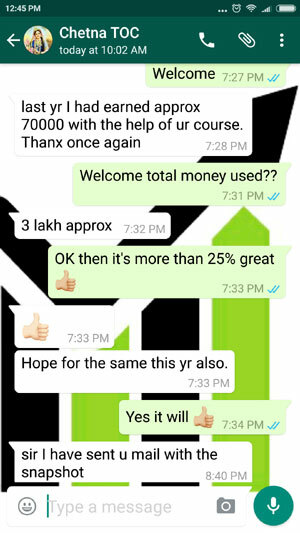 There is a great hedging trade in my course that you can trade if you have done my course OR at least buy ATM options to protect unlimited loss your Future can take. If selling Futures buy ATM Call and if buying Future buy ATM Puts. There you are your unlimited loss is not limited to the price you paid for the options. A lot can also be done when Nifty moves 10% up within days – that is a shorting opportunity. Well that’s for another day. Very very Informative & most important article by you Sir. Keep writing.Hope this will really really help traders & investors 100%.